Lemmie has made many false changes against me on this forum, even going to other forums trying to find things I said that he can then misrepresent and lie about, that I have also corrected him about on this forum when he's brought them up, whether it's concerning my working and income, or whatever, yet he ignores it, and just keeps lying. I'm not going to drag all of his lies and list them here, but I'm going to simply address one of his latest to demonstrate how he and others here lie, because others have also lied about me, calling me a liar on this issue, and so many others. You all are aware that ldsfaqs is a real-deal food addict and pathological liar, right? Yes. All the more reason to not humor his pathology, it simply gives him a platform to continue the lies. Notice how when he got a little encouragement, the thoroughly debunked story about "artifacts*" in his eyes came back? So far, the drops keep them in control, apparently, but my prediction is next week there will be another story about the utter pain and having to dig them out with Q-tips again. Or he will move on to another imaginary symptom. The head pain one is brewing in the background of a number of his recent posts, I've noticed. *artifacts = another term for floaters, which do not cause pain, and can only be removed surgically. 1. Actually I'm not a "food addict". At the most I have binge eating syndrome which is a mental health issue, a way people deal with stress getting pleasure from food which they can't get in other ways, which is not unreasonable to understand given my entire life. And it's actually a small problem I've had most of my life. 2. You confuse your lying with me lying. I don't lie. Thus, that makes you people the "pathological liars". After all, it takes truly mentally ill people to constantly call someone a liar in relation to their personal life, when YOU don't actually KNOW. You people calling me a liar when I say I get eye artifacts which cause pain, and build up to severe pain even. Guess what, there are different KINDS of eye artifacts, not all are "soft and cuddly", not causing pain. Mine being "painful" is likely due to my severe dry eye, so they harden more, and then in combination causes pain. I've had several times the situation/pain being so bad, that my entire eye would close up and be all red. I have to take ACETYLCYSTEINE eye drops 4 times every day, which they have to specially make only in Salt Lake, I can't get it ANYWHERE ELSE in order to prevent the eye artifacts from forming. Anyway, the ONLY "pathological liars" are you people, and I prove it every single day whether it's concerning me or political issues. There are a couple of things which I don't say, because some things are none of your people's business, but everything else I've ever said, is 99.999% the absolute truth. So yes, recognize things for what they are, that you people are evil to your core. P.S. For you ignorant fools who may search for the above drug, and want to call me a "liar" again because you see they only say it's a medicine for "Asthma" related things, do a search for the drug name WITH "for eyes" added to the search. 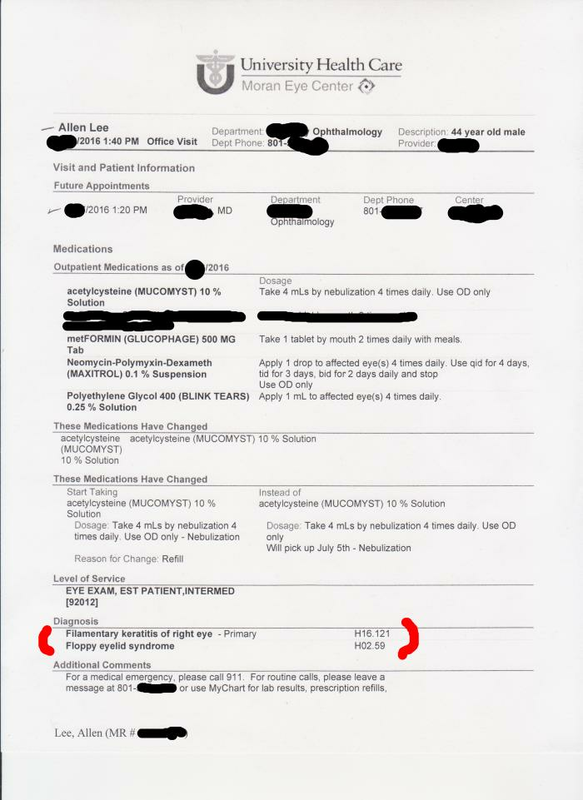 So, as can be seen if anyone looks at the actual FACTS per the info and links I provided, I have been ENTIRELY telling the truth concerning my "eye artifacts" which cause pain. Yet over and over, the evil liberals on this forum call me a "liar"..... and you all do it over and over again, about everything. Now the question is, will any of you repent? Never I'm sure, because none of you ever do, save maybe Jersey Girl some, the only person on this forum that seems willing to try and look beyond appearances on a forum and her own biases, and the others only being the Conservatives, which have always represented me fairly and accurately, while the rest of you liberals LIE over and over again. What we have here, is an example of how Liberalism is "evil" in the heart of man.... how it perverts, corrupts, lies so willfully and willingly. Here we again, just like I did with my Marine Service when the Liberals/Anti-mormons here LIED over and over for a couple of years, claiming I "never was a Marine"..... I finally demonstrated my claim by showing a pic or two from my service, thus proving I WAS a Marine, so I yet again prove the liberal and anti-mormons as LIARS..... Willful liars. Showing who are the ACTUAL "pathological liars" on this forum. It is YOU all..... not me. I lie about nothing (you need to know about anyway). Last edited by ldsfaqs on Tue Sep 13, 2016 10:06 pm, edited 1 time in total. Binge eating syndrome isn't an actual condition. You probably mean binge eating disorder, which is an issue of addiction studied as such. I worked in a lab specifically with rats bred to be binge eaters to study the neurophysiology of reward evaluation and motivation. The lab specialized in addiction research and grant money came from that pool of resources. Your description of why you experience it is probably incorrect, but many addicts misattribute the basis for their addiction, so there's nothing special there. You compulsively overeat and, like addicts of many sorts, mislead others about it. Unlike some other addictions, though, the effects of this one are quite obvious and you can't really hide it. So when you softball what you've done, the pictures you unwisely shared tell the actual story. That's probably your biggest lie. Not that I'd expect you to admit it, but it's obvious ldsfaqs. Obvious. Lemmie is a female poster. Your description of why you experience it is probably incorrect, but many addicts misattribute the basis for their addiction, so there's nothing special there. He may be a food addict, but he's a food addict who eats his feelings. This is evident in a number of his posts where he admits that he eats his feelings and in other posts where it's inferred. My only "eating addiction" is sometimes "binge eating", and it's in relation to feelings. Like if I eat pizza, I'll often eat the entire pie, even two pies when I was in my 20's. Of course, I was also super fit then, so could do so. Ironically, I can't actually do that anymore because my stomach is so much smaller and my metabolism is so much lower. I can only ever eat like 3 or 4 pieces of pizza on the very rare occasion I've had it, me or roommates the last few years. As to Lemmie, see that's how "little" I go "personal" with the people here, I don't even pay attention or care about the "gender" of the person. For as big as you are ldsfaqs, even if you have suffered from metabolic adaptation after a period of rapid weight loss (that did not occur) you still need a ton of calories just to maintain a sedentary lifestyle. Keeping you alive takes a lot of energy. I'll spare you the embarrassment, but type in your measurables into an online kcal calculator and look at the maintenance number. Even assuming a metabolic deficit, that's still a ton of calories, right? You don't need to B.S. us on how you are barely eating anything and your metabolism is just that slow. You'd be losing weight rapidly if you were eating what you represent. - I do binge eat often. B. Don't have all the right foods I need for low calory eating. C. As a result eat a lot of high carb foods and fat. So, while I'm not generally eating a "ton" of food, I'm eating high calories. Like today, do you want to know all I ate, and I'm entirely full? FYI, I got all of this increased fat from ONLY eating church food for 2 years. I'm stable since I've been on foodstamps also, because I'm trying to eat other things, other than all the carbs and fat I eat from the church food since that's pretty much all they have is carbs fat protein. by the way.... What about the OP??? Why is this yet another thread YET AGAIN about ME "personally"??? haaa haaa haa..... pointless personal attack. by the way, I thought that season was their best. I know. Sadly for you, I read your posts and file it away in what's left of my memory. Like Donald Trump, you don't understand the difference between 'I don't lie' and 'I mean what I say 100% in the moment'. 1. You discussed yourself personally in the OP embedded post and your response to it. 2. You fall for every tangent that's placed in front of you instead of staying on track. If you had focused on the eye artifact issue alone, we wouldn't be looking at your food list for today. So I see no apology from Lemmie..... just as I thought, not surprised. Corruption and evil is the liberal way. You could literally subsist entirely on twinkies and have the foods you need for low cal eating. It's harder to be restrained with twinkies, of course, but this just isn't true. It's also entirely possible to structure healthier, more voluminous meals based on Quest and food pantry items. I help people with this professionally. I understand there are barriers to you doing this given your abilities and deficits, but you also use it as an excuse that is inaccurate. I suspect you understand things like portions and serving size and can read universal labels. You know that vegetables that require very little preparation exist. What you lack is the ability to avoid eating huge amounts of calories. I'm sympathetic here, as I know it isn't as simple as lame motivationals regarding willpower. But I also am not a fan of the stories that don't add up. Uh, you created the thread and I'm responding to it? There's various calculators out there that estimate based on age, gender, weight, and height roughly how many calories you need to eat in a day to maintain where you are at. The number that you get with these is general and there is variation within people who match your body type. Metabolic adjustment after weight loss for the morbidly obese is a very real thing. But, ldsfaqs has shared pictures of himself that actually make it easy to estimate what those numbers might look like for him even if we are being generous about metabolic issues. Plug them in and see the kind of calories he has to be eating to not be losing weight relatively fast. The thread subject matter was concerning Lemmie as in all cases and liberal/anti-mormon individuals on this forum constantly lying, more specifically about ME. The thread wasn't about my "eating habits". Last edited by ldsfaqs on Tue Sep 13, 2016 8:41 pm, edited 1 time in total. Such flair! Such poise! Such panache! Dance for Shades' amusement, monkey! You talked about binge eating in your own OP. Now, silence! Amuse Dr. Shades with your tomfoolery!